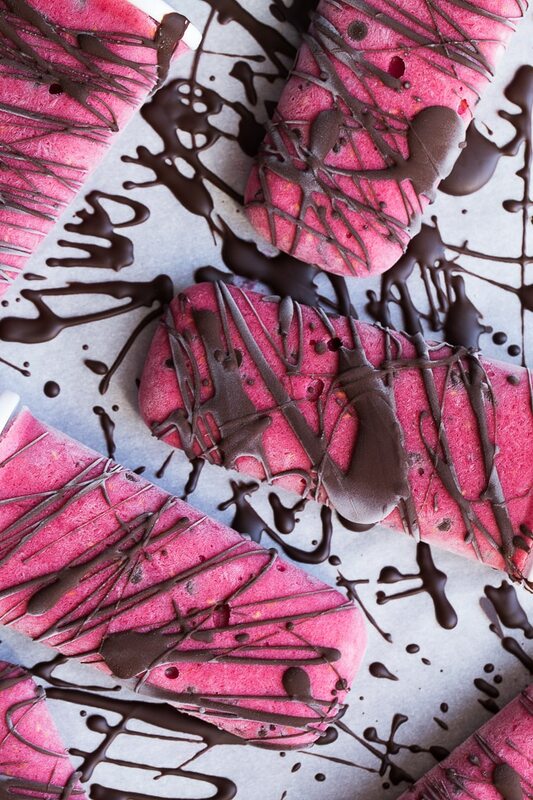 Raspberry Chocolate Chip Nice Cream Pops are the ultimate healthy summer treat! You just need 5 ingredients and a few minutes to blend up these delicious pops. The hardest part will be waiting for them to freeze! Hello, and welcome to summer…..finally! I know most of you have been enjoying summer for weeks now, but we are finally getting some sunshine and warmer temps in Newfoundland. (Okay, maybe not today, but it has been a lovely week!) And as the weather warms up, my craving for all things ice cream kicks in! 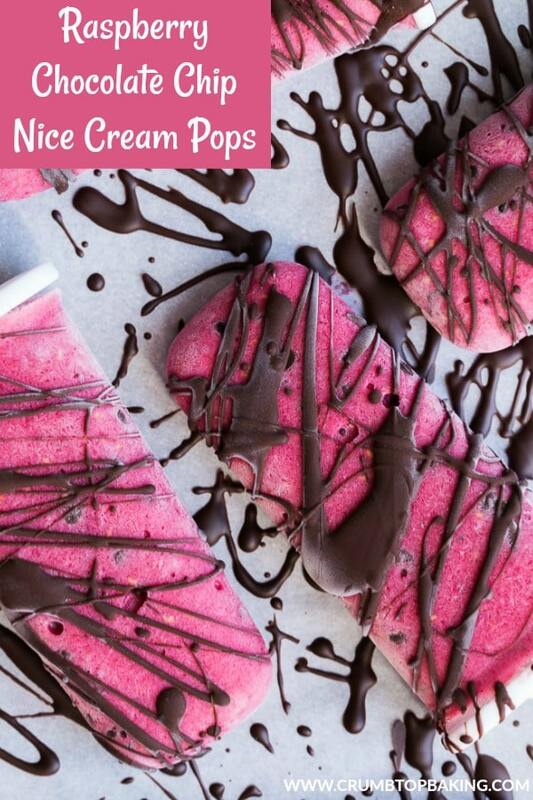 So naturally, these Raspberry Chocolate Chip Nice Cream Pops have been on repeat all week! Of course, when I say I’m craving ice cream, I really mean nice cream. An easy, dairy-free alternative to ice cream! It’s similar to the ingredients you might add to a dairy-free smoothie bowl, except it has a thicker and creamier texture, and you freeze it, obviously! The simplest way to make nice cream is with frozen bananas and your choice of add-ins like fruit, chocolate or nut butters. What you add depends on the flavor you’re going for. Blend it all up with some dairy-free milk, place in the freezer, and once it resembles the texture of ice cream, serve it up! The banana creates the creamy texture and naturally sweetens the nice cream. For additional creaminess, I sometimes add full fat coconut milk, especially when making a larger batch of nice cream. But using bananas is the quickest and easiest way, especially if you’re just looking to make a single serving. Nice cream makes a great afternoon snack or dessert, or when it’s loaded up with fruit, nuts and granola, it makes a great breakfast too! Since I’ve been making a lot of nice cream lately, I thought I would buy some popsicle molds and make nice cream pops. It’s the same ingredients, except now I can enjoy my nice cream in a convenient handheld form! Since you’re blending together frozen bananas and other frozen fruit with just a small amount of liquid (in this case, almond milk), I suggest using a high-powered blender or food processor. I usually add unsweetened almond or cashew milk to these pops, but you can use a dairy-free milk of your choice. Chocolate chips are a must in these popsicles! I like to use mini, dark chocolate chips. If you want these pops to be completely dairy-free, make sure you use dairy-free chocolate chips. 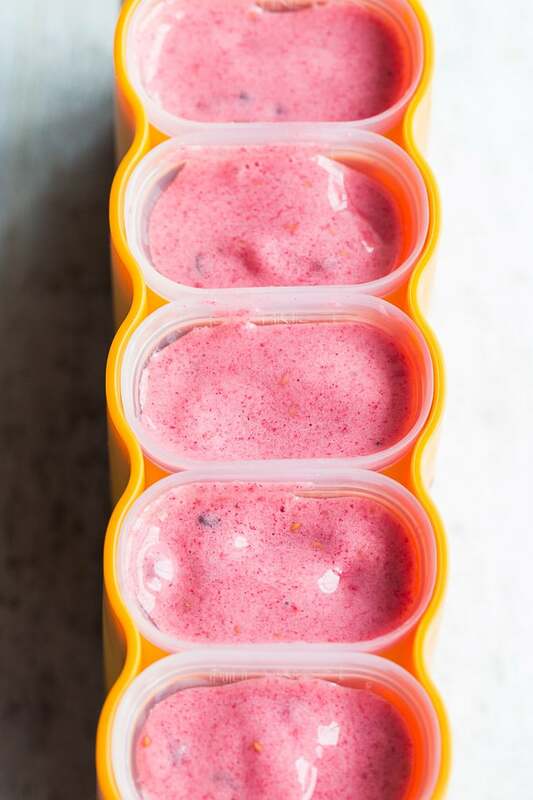 I often add collagen powder to my smoothie bowls for some added protein, so I added a little bit to these Raspberry Chocolate Chip Nice Cream Pops. It’s just a tablespoon so it’s totally optional. If you want these pops to be vegan, just leave out the collagen. The dark chocolate drizzle is also optional, but totally recommended! That’s it! Pretty simple, right? If you make these pops, I would love to know what you think! Feel free to leave a comment below with a rating! And if you take a picture, you can always share on Instagram. 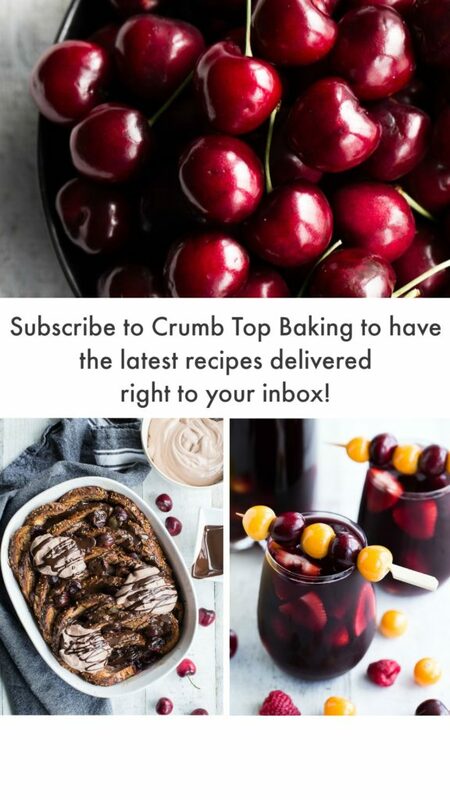 Just tag @crumbtopbaking so I’ll see your creation! 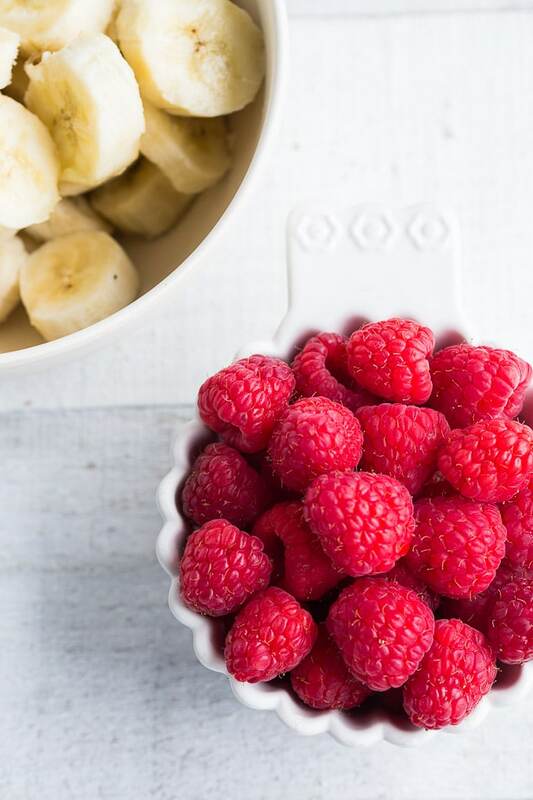 Add the bananas, raspberries, almond milk and collagen powder to a high-powdered blender or food processor and blend/process on high until smooth and creamy. You may need to stop and scrape down the sides a few times. Stir in the chocolate chips and pour the mixture into popsicle molds. Place in the freezer for 6-8 hours, or until frozen. Before serving, run the molds under warm water to help release the pops. If adding the chocolate drizzle, lay the pops out on a baking sheet lined with wax paper and use a spoon to drizzle on the melted chocolate. Place the pops back in the freezer to set up. Once set, store in an airtight container in the freezer. If you don’t have collagen powder, or would like these pops to be vegan, just leave out the collagen. For the dairy-free and vegan option, also make sure your chocolate chips are dairy-free/vegan. Because I digestive issues, I’ve had to start severely limiting dairy. That means I need more nice cream recipes and I’m in love with these Leanne! 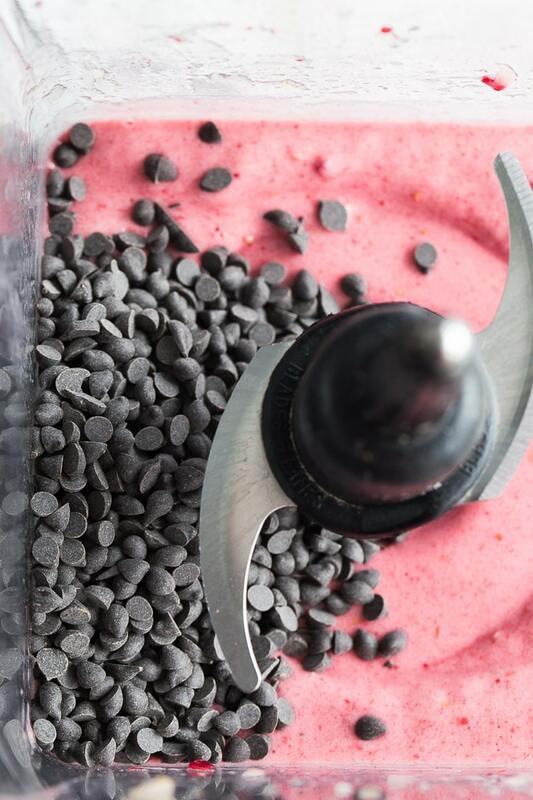 Adding raspberries and dark chocolate chips make them the ultimate guilt free summer treat! Thanks Marcie! I’ve had to limit dairy too, and I’ve found nice cream is the perfect way to get my ice cream fix! And I agree, this is a guilt free summer treat I’ve been enjoying a lot lately! Wow the pictures look amazing!! These look so decadent! Perfect for summer. Thanks Terry! I’m glad they look decadent, because these treats are on the healthy side! I’ve been eating nice cream obsessively lately. I usually just make mine with peanut butter but I’m going to have to try these! SO GOOD! Thanks Kelsie! While I love this raspberry chocolate combo, my favourite nice cream is chocolate peanut butter! So I can totally understand obsessively eating it! Your photos and this recipe are so summery and inviting! Can you believe I’ve never had nice cream? That needs to end STAT! Thanks so much Annie! That means a lot! You really need to try nice cream ASAP. You don’t know what you’re missing! These look so good! They would be great with dairy free milk and Enjoy life chocolate chips! Thanks! Totally agree Corinna! I usually make them with almond or cashew milk! Haha! Thanks Dawn! I’m glad you agree that the chocolate is not optional! And I’m also glad you see all the drizzle as art and not one big mess I had to clean up after! I love the combo of raspberry and chocolate Leanne! So delicious and a great clean treat! Thanks Tanya! 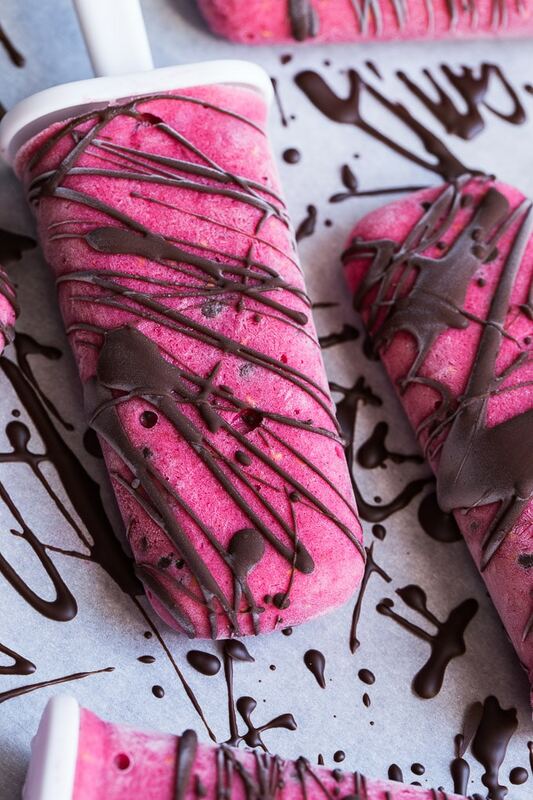 Raspberry and chocolate is absolutely a great combo! And keeping it clean was my main goal! It’s roasting here Leanne, so these will totally do the trick! 100 degrees today! Love the flavor! Thanks Sheryl! It’s a great combo, and definitely refreshing for summer! OMGoodness! What’s not to love!!??? Perfect for summer, fruit and chocolate together! Pinning! Thanks Kim! Glad you agree! And thanks for pinning! Hope you’re having a great week! What an absolutely beautiful treat! Sometimes the simplest things are the best, aren’t they! I couldn’t agree more Cathy! Some of my fave recipes are the simplest recipes! Thanks for stopping by! These are just gorgeous! Love that chocolate drizzle! I need to get a popsicle mold so I can make these! Thanks Lisa! You absolutely need a popsicle mold! I’ve been getting good use out of mine this summer! 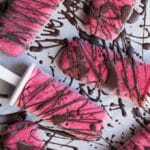 I need to get some popsicle molds and make these! I love that this is “nice cream” because I can’t have dairy! YAY for this recipe!! Thanks Kelly! I try to limit dairy too, so nice cream is on repeat in my house! You totally need to buy some popsicle molds. They are perfect for nice cream! Thanks Ben! We have had a few down pours of rain and high winds, but it hasn’t been too stormy. The weather this past week has really felt like summer! I’m glad raspberry and chocolate are one of your exceptions! Thanks Askika! Raspberry and banana is one of my favourite nice cream flavours. And lots of chocolate drizzle is required! I hope you get a chance to make them soon! Thanks for saving! These sound so perfect for me. 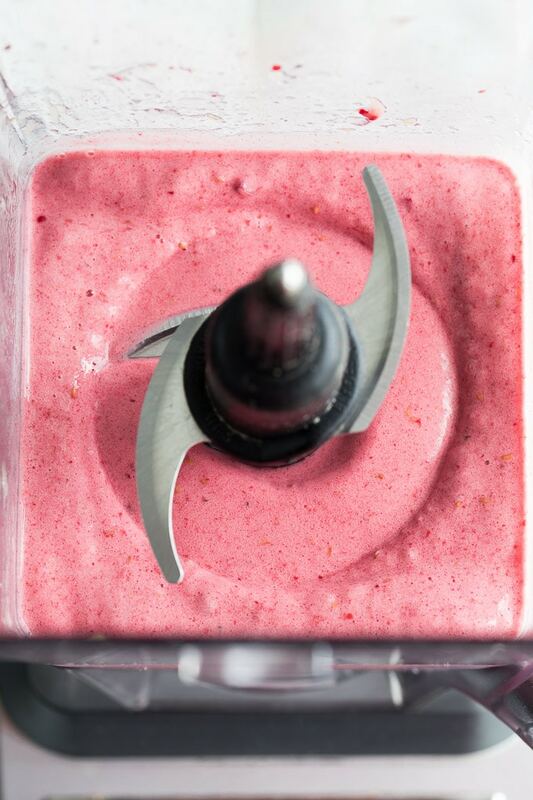 Raspberries are one of my favourites this time of year and I am constantly blending them up. The addition of collagen is perfect for a tasty healthy treat! Thanks for sharing Leanne! Thanks Lizzy! The raspberries are so delicious this time of year! Glad you like the addition of collagen. It’s optional, but it’s great for folks that already add it to their smoothies and nice cream!